Food posts are my way of procrastinating sharing more complicated things. Hopefully you find them just interesting enough to keep checking back in. Next weekend Team Velcokitty Snuggles will be doing the 8 hour Rib Mt. Adventure Race. Not only will it be my first adventure race, but my third time mountain biking in the last eight years. I’m sure there will be some type two fun in there. In the meanwhile… I made another recipe from The Laws of Cooking. I chose Justin’s “chicken shwarma in a can” but figured it was basically a meatloaf and neither the can or the DIY rotisserie was necessary. Other than that, I actually followed his recipe which means I shouldn’t just give you all the details. Get your hands on his book! First I made meat goo. Mixed yogurt, honey, dijon mustard, garlic, buttermilk powder, parsley, dill, and paprika. Oh, and I see from the picture I also added dried onion because I found it in my spice stash. Then added the ground chicken. I let that chill for a while (I think it was supposed to be 2-24 hours). I stuffed it into a loaf pan and stuck it in the oven. It got a wee bit overcooked. While the meatloaf was in the oven, I made the banana amba. Apparently amba is traditionally sweet-tart mango condiment from the middle east. I had no idea that my life was missing this. I cooked mashed banana with toasted mustard seed, oil, honey, dijon, and vinegar. This stuff is fantastic. Later I smeared leftover amba on toast and it was an excellent breakfast with my coffee. I should make this again just for toast. The meal needed something healthy so I looked up mustard in my trusty Vegetarian Flavor Bible. I settled on a broccoli and brussels sprout slaw. I used many of the same flavors from the chicken – honey, mustard, buttermilk powder, and the spices. I also wanted it to complement the sweet-tart banana amba, so I added some maple syrup and apple cider vinegar. We’re going to ignore that I also made banana mashed potatoes which tasted great but I forgot to cook the banana and the whole thing turned gray, and then later black. Everything else was perfect. 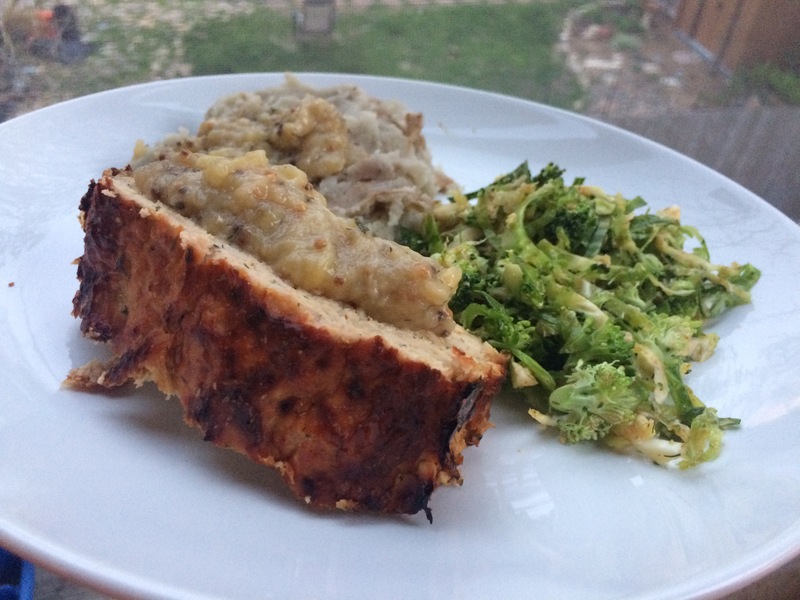 This entry was posted in Kym Cooked and tagged amba, banana, chicken, meatloaf, procrastinating, slaw, The Laws of Cooking. Bookmark the permalink.